Preheat the oven to 180C/gas 4. Toss the sweet potatoes with 1/2 tbsp oil and season. Roast for 30 minutes, until tender. Meanwhile, make the slaw. To prevent the fennel browning, squeeze a little lime juice over it. Toss with the fruit; set aside. For the dressing, mix the coconut milk, lime zest and juice, salt and the rose water – not too much, or it will dominate. 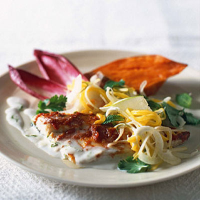 To serve, place half a sweet potato on each plate with 2 chicory leaves and the fish, sambal-side up. Mix the mint and most of the coriander into the slaw, then put a spoonful on each plate. Spoon over the dressing, garnish with reserved coriander and serve immediately. knife will do fine and is good practice. citrus fruit flavours, notably lime.